For the Expo 2015 project we talked about one of the symbols of the UK: tea. It is said in China that the first person to discover tea was Shen Nong (2700 BC), the father of agriculture and herbal medicine. 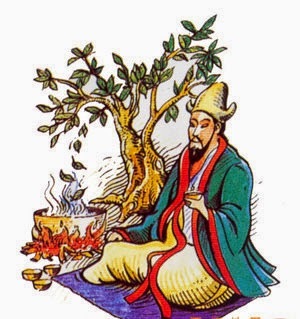 In an ancient Chinese medical book, called The Divine Farmer’s Herb-Root Classic, written during the Han Dynasty, it is said that Shen Nong tasted 100 plants in one day, consuming 72 different types of poison in the process; tea leaves were used to remove the toxins from his body. Two other interesting versions of this story have also been documented. In ancient times, people knew little about plants. To determine which plants were edible, poisonous, or medicinal, Shen Nong tasted various kinds of plants every day. Fortunately, Shen Nong had a transparent belly, making it possible for him to observe the reactions in his stomach caused by the plants he had eaten. When he tasted tea leaves, he found that the tea leaves passed through his stomach and intestines, checking for poisons in the stomach and cleaning the intestines. Shen Nong referred to these leaves as Cha, which has the same pronunciation as “checking the poisons” and became the plant’s current name (tea). 2. Drain the cucumbers and pat them dry with a clean dish towel or paper towel. 3. For every two slices of bread, spread both slices evenly and thinly with butter or herbed butter. 4. Cover one side of the sandwich with sliced cucumber in one to two layers. 5. Season with lemon juice and spices/herbs. 6. Put the slices together, cut off the crusts and slice the sandwich diagonally two times to create four triangle-shaped finger sandwiches. · Grease and flour a heavy baking sheet. · Sieve the flour into a roomy baking bowl then add the butter, baking powder and salt. Quickly rub the butter into the flour until the mixture resembles fine breadcrumbs. · Make a well in the center and using a dinner knife, stir in enough milk to make a soft, pliable dough. · Turn the mixture on to a floured board and knead very lightly until just smooth then lightly roll out to 2 cm / 3/4" thick. · Cut rounds with a 7.5 cm / 3" cutter or cut into triangles with a sharp knife. · Place on the baking tray and brush with the beaten egg and milk mixture. Bake near the top of the hot oven for 15 minutes or until golden brown and well risen. · Cool on a wire rack before eating. Even though we don't know if the legends about tea are true or false ,nowadays tea is the third drink cunsummed in the world...and I like it too! i love legends and this is very interensting. 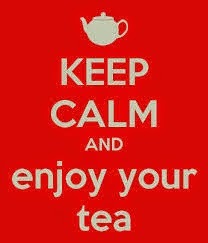 The posters are very beautiful and now i can prepare the scones to eat with my tea!